Based on an initial look at North Korea’s coal industry, the country’s larger coal mines have remained active despite the increasing restrictions on the North’s coal exports. Part I of this report examined two areas of North Korea’s coal industry: 1) its mining in the South Pyongan region, and 2) its rail coal transfer stations located along the Taedong River, which flows through the region. This report (Part II) examines two key coal ports and the rail transfer yards along the Chinese and Russian borders. While a degree of ambiguity resides with the activities observed at each of these facilities, the coal ports and border rail transfer yards remain a key component in monitoring compliance with UN Security Council resolutions; it may also provide indicators as to how aggressively the DRPK is executing Kim Jong Un’s guidance to redirect the country’s coal toward meeting its domestic energy needs. Export activity can be observed and monitored at two of North Korea’s larger ports and at two of the smaller ports designated as coal ports. To a lesser extent, rail classification yards located at or near key border cities can also be monitored to some degree, but because trains are more fleeting, and ore cars may be staged in a loaded or unloaded state, determining how much coal is being moved through these yards is difficult to assess. When present, stockpiles of coal in the yard area can provide an indicator of activity, as piles grow or shrink in volume. In Part I, we examined the Sunchon Coal Port located northeast of Pyongyang on the Taedong River, and the Ryongchon Coal Port, located at the mouth of the Yalu River south of the Chinese city of Dandong. In Part II, we focus on Nampo, the largest west coast port servicing the Pyongyang area, located on the mouth of the Taedong River, and Rajin, a medium-sized port, located on the east coast near the Russian border. 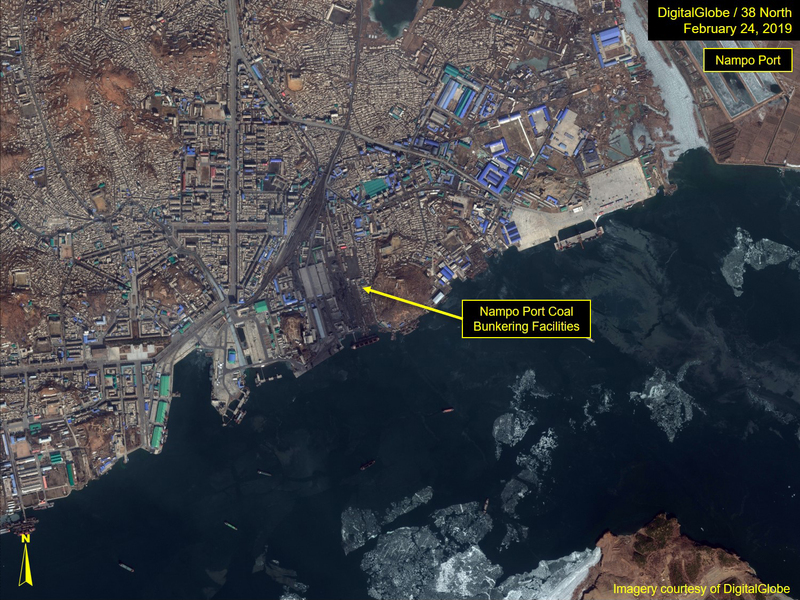 While not specifically a coal port, Nampo has within its facilities a large coal-transfer/bunkering quay area. The majority of large, bulk cargo exports of coal originates from there. Monitoring shipping from the port has revealed trends which track closely with developments on the sanctions front, but with some interesting oddities. Figure 1. 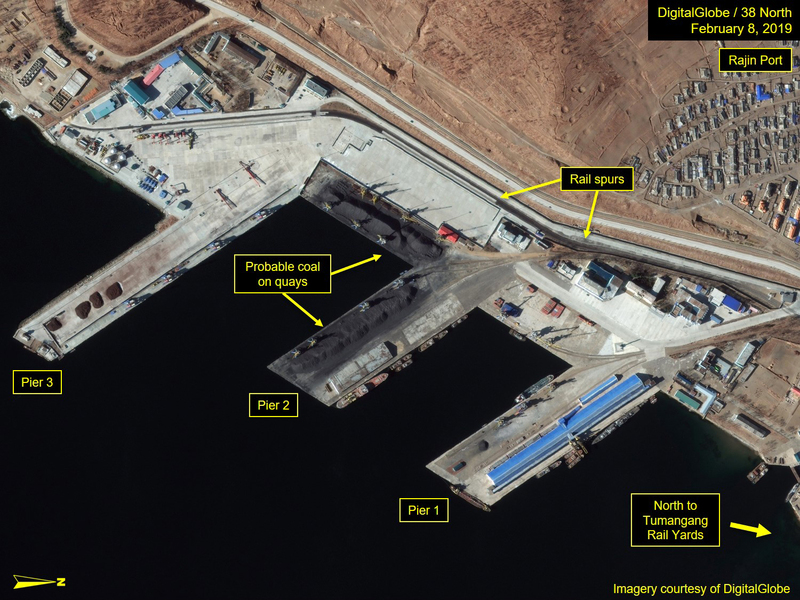 Overview of the Nampo Port, February 2019. From the period between February 2016 to January 2017, it was common to observe three large bulk cargo vessels at the quay and bunkering pier; three large ships being the maximum capacity. On February 18, 2017, however, only one 5-hold cargo ship was present, and a general trend of one or no vessels was observed over the next couple years as late as February 24, 2019, when only a 3-hold bulk carrier was present. 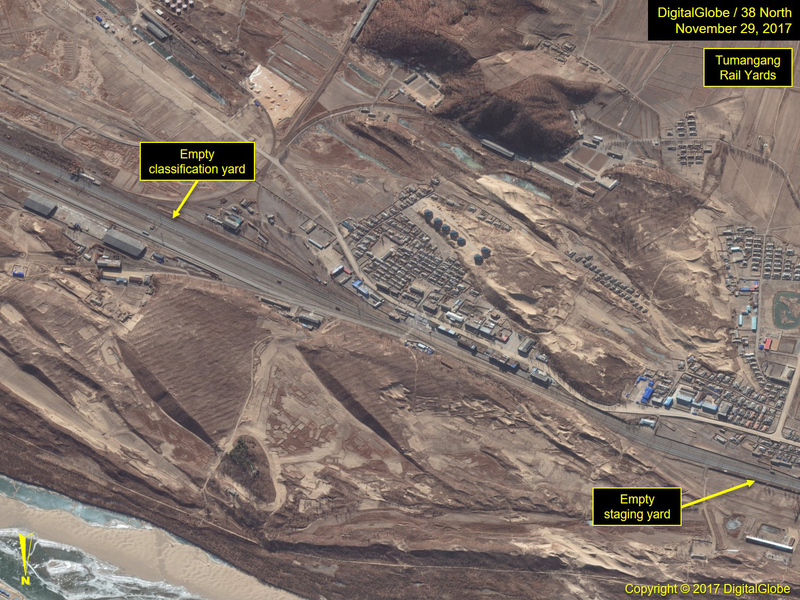 However, in imagery from March 13, 2019, no vessels were present, but 21 coal cars were positioned at the bulk ore storage area, and approximately 25 more were observed in the adjacent rail yard. While the presence of vessels seems to have been reduced significantly, shipping has not stopped, and throughout this period, the probable coal stores on the wharf, while shifting in size and placement, have remained robust. Figure 2. Probable coal stores in bunkering areas at Nampo, February 24, 2019. Rajin serves a unique role as both a transshipment port for overseas import/export trade and also as a terminus for the Rajin-Khasan Railway, which provides a land link between North Korea and Russia. Russia, a coal exporter itself, has sought to open a port to gain easier access to both Japan and South Korea. In a trade agreement with North Korea, Russia invested nearly $30 million to refurbish the pier and rail line to Khasan, making it into a more capable international transshipment facility. The Rajin port has three large wharfs/quays. The southern-most pier, Pier 3, and an adjacent, separately-secured storage area serviced by a rail, was leased by the Russians in 2008 (for 50 years) and serves as a shore-to-ship coal transfer facility. However, major investment to improve the infrastructure to this port did not begin until around August 2011, following a series of visits by Kim Jong Il to China and Russia to seek economic cooperation. In imagery from March 4, 2011, there were no indications that Rajin was to be a coal transfer port. By February 2016, what appear to be coal deposits are present on Pier 3’s quay and in the adjacent, separately-walled, open storage area. Also a large bulk cargo vessel is docked at the quay. It should be noted that in March 2016, Seoul informed Moscow that it was suspending the Rajin-Khasan logistics project aimed at transporting coal from Russia to South Korea via North Korea, despite special exemptions for this cooperation in UN Security Council Resolution 2270. At that time, only three shipments had been made along the 54-kilometer route between Khasan to Rajin, aimed at delivery to South Korea. Infrequent coverage followed until March 17, 2018, when the coal stores were no longer seen in the Russian-leased areas. Instead, piles of probable coal were located on the quay of Pier 2 and on the quay between the piers. Five images from then until February 8, 2019, show no other changes, and only one cargo vessel was observed at the quay during that period. Despite five images of Rajin in 2018, a cargo vessel was observed only once, but the coal stores on quays have remained constant and significant in volume. No coal trains were observed at the adjacent rail spur during this period either, although unlike cargo ships which may take several days to load, trains can load and unload quickly, and therefore, are more fleeting. Figure 3. Probable coal on quays at Rajin coal port, February 8, 2019. These observations track closely with the issuance of numerous UN sanctions resolutions as well as Seoul’s decision to not allow vessels that had been docked in North Korean ports into South Korean ports. As such, the Russian coal stores became rapidly depleted, but began showing up in large quantities on Pier 2 and the quay area between the two piers. The appearance of probable coal stocks on these other quays is intriguing, as they only appeared after the closure of the Russian areas. There are a number of reports which reference the Russian and Chinese laundering of coal shipments. With regard to Russia, coal has been and is being moved by ship to two ports near Vladivostok, Kholmsk and Nakhodka. From there, it is transloaded onto Russian ships for sales to Japan and South Korea, and presumably other countries as well. Nampo, Wonsan and Chongjin were specifically named in those reports, but Rajin could also be in the mix. Coal can be moved from the Rajin coal port by rail to Russia via the Rajin-Khasan Railway, although nothing has been observed on satellite imagery to support this is taking place. The North Korean rail lines follow the Tumen River, and the original vision for the Rajin-Khasan Railway was to have included China in the trading arrangement. As such, North Korea could attempt to export its coal through other crossing points such as the Namyang to Tumen crossing point. The Sinuiju classification yards are located on the east side of the rail/auto bridge, referred to as the Friendship Bridge, which crosses the Yalu River, connecting Dandong, China with Sinuiju, North Korea. Reportedly, it has been used for the export/import of goods between the long-time allies and trading partners, including coal. A brief review of imagery taken from between March 2015 to March 23, 2019, showed a general downward trend of ore cars present in the yard. From March 3, 2015 to April 10, 2017, the number of ore cars present ranged from 30 to 70. However, in imagery from November 24, 2017, there was a significant drop to only about a dozen ore cars, all empty. Their numbers grew briefly in February 2018, when 30 to 50 ore cars were observed on three successive images, all empty. By May 4, 2018, and continuing through March 23, 2019, the numbers decreased again with only a dozen or fewer probable ore cars observed at a time, although there were tens of passenger and box cars seen throughout this period. These dates tend to coincide with when China claimed it refused coal imports from the DPRK. However, the reason for the brief increase in ore cars in February 2018 is not fully understood. It is noteworthy that there is a large covered platform section of tracks, which may serve as a passenger terminal, and which conceals a portion of the yard activity in winter months due to sun shadows. Figures 4 & 5. 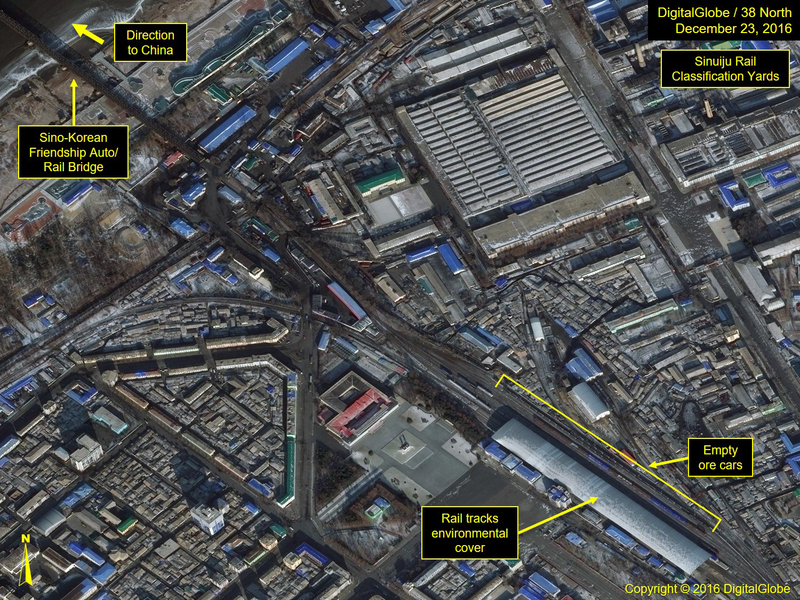 Overview of Sinuiju Rail Yards from December 2016 to November 2018. 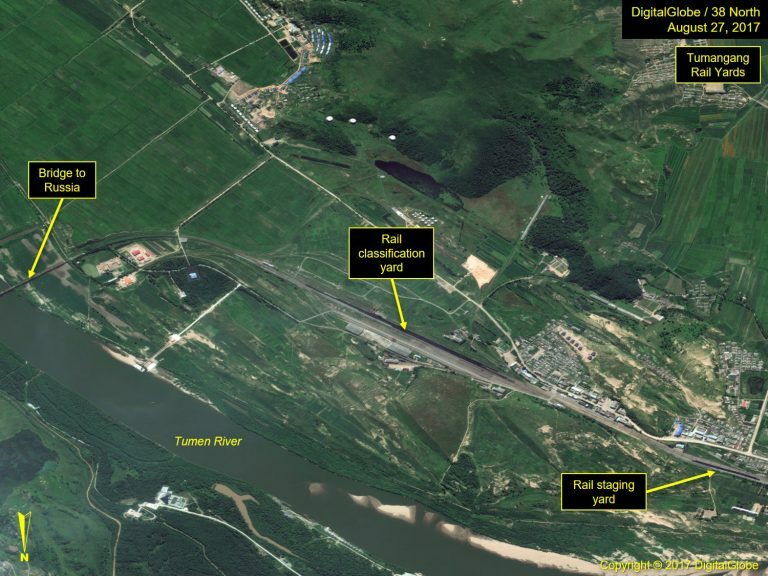 The rail yards are located near a rail bridge crossing the Tumen River, which connects Tumangang, North Korea with Khasan, Russia. Reportedly, this crossing has been the principal route for moving coal ore from Khasan to Rajin. Coverage of the yard is limited between August 27, 2017, when tens of ore cars were observed in the yard, to November 29, 2017, when no ore cars were present. This change in activity coincides with the passing of the UN Security Council resolution, and the absence of coal on the Russian-leased pier at Rajin Port. In images between April 2018 to February 7, 2019, rail car activity was again observed, but most appeared to be box and tank cars. With such a small sample, a trend cannot be fully assessed but the possibility of coal cars quickly passing through should not be dismissed either. Figures 6-8. Overview of Tumangang classification yards and proximity to Russia. Figure 6. Overview of Tumangang classification yards and proximity to Russia. Figure 7. Close up of Tumangang rail classification yard. Figure 8. Close up of Tumangang rail staging yard. Figure 9. Lack of ore cars at Tumangang rail yards, November 29, 2017. Sinuiju is not the only rail crossing point from North Korea into China. Namyang to Tumen, Chongsu, and Manpo were also examined. 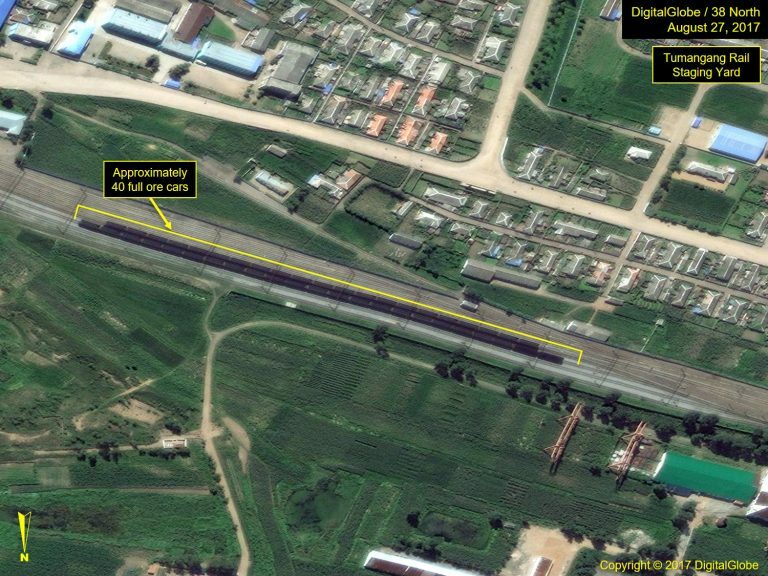 While the latter two may be used, there was no clear evidence of either coal cars (full or empty) staged on the North Korean side of the crossings and/or stores of coal piled at the yards to be loaded, albeit ore cars were observed at Manpo. 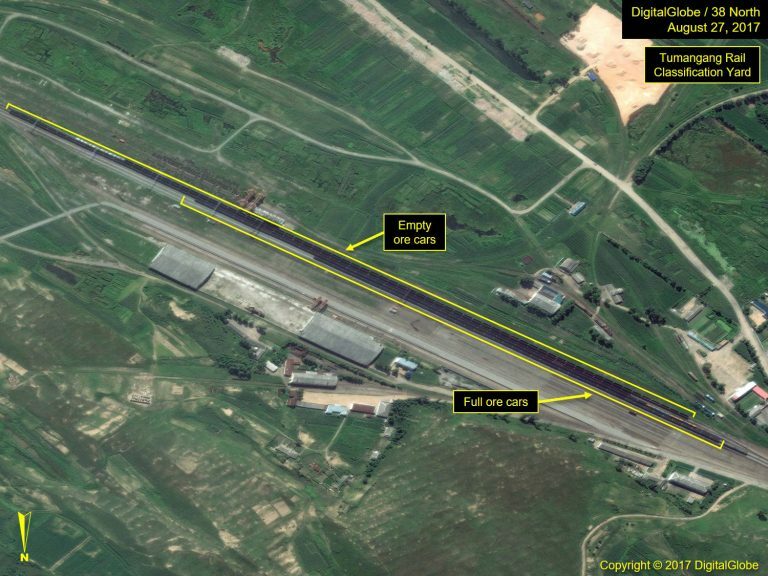 The exception is the Namyang to Tumen, China crossing point, where there has been considerable imagery covering the area from May 2017 to February 2019. During this time, while coal stores have not been observed in the Namyang rail yards, Tumen has several large coal storage areas. The probable coal ore in those areas has increased and diminished throughout the period examined, although from August 2018 to February 2019, the overall stores appear increasingly depleted. 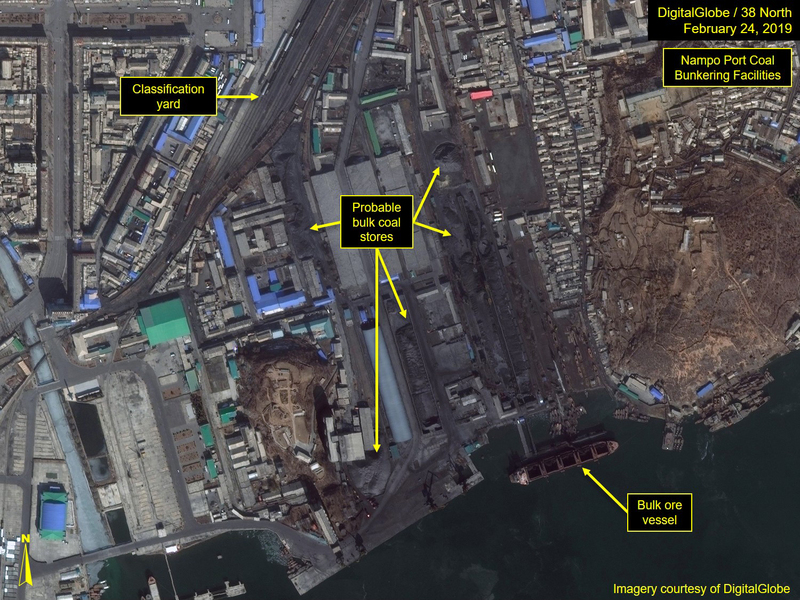 Whether this is a function of transfers being made and simply not detected on the North Korean side is unclear, but this area merits continued monitoring. Chan, Tara Francis. “North Korea Reportedly ‘Laundered’ Coal Through Russia in Apparent Breach of Sanctions.” Business Insider. March 4, 2018. https://www.businessinsider.com/north-korea-laundered-coal-sold-to-south-korea-and-japan-2018-3. Chung, Jane. “North Korea’s Push to Use More Coal Clouds Environmental Future.” Reuters. January 28, 2019. https://uk.reuters.com/article/uk-northkorea-pollution/north-koreas-push-to-use-more-coal-clouds-environmental-future-idUKKCN1PN0BP. Denyer, Simon. “China suspends North Korean coal imports, striking at regime’s financial lifeline.” Washington Post. February 18, 2017. https://www.washingtonpost.com/world/china-suspends-north-koreas-coal-imports-striking-at-regimes-financial-lifeline/2017/02/18/8390b0e6-f5df-11e6-a9b0-ecee7ce475fc_story.html. Faulconbridge, Guy, Jonathan Saul and Polina Nikolskaya. “Exclusive: Despite Sanctions, North Korea Exported to South, Japan via Russia – Intelligence Sources.” Reuters. January 25, 2018. https://www.reuters.com/article/us-northkorea-missiles-coal-russia/exclusive-despite-sanctions-north-korea-exported-coal-to-south-japan-via-russia-intelligence-sources-idUSKBN1FE35N. Meng, Meng, and John Ruwitch. “Exclusive – North Korean Ships Head Home after China Orders Coal Returned.” Reuters. April 11, 2017. https://www.reuters.com/article/uk-china-northkorea-coal-exclusive-idUKKBN17D0DA. Rolland, Nadge. “North Korea New Best Friend: Russia?” The National Interest. April 28, 2015. https://nationalinterest.org/blog/the-buzz/north-koreas-new-best-friend-russia-12747. “Russia Carved Out Exceptions to North Korean Sanctions.” Radio Free Europe. March 3, 2016. https://www.rferl.org/a/27586476.html. “Russia Re-opens Railway Link with North Korea.” Reuters. September 22, 2013. https://www.reuters.com/article/us-nkorea-rail-russia/russia-re-opens-railway-link-with-north-korea-idUSBRE98L0BB20130922. Tanaka, Takayuki. “North Korea Sanctions Rattle Russian, Chinese Businesses.” Nikkei Asian Review. September 23, 2017. https://asia.nikkei.com/Politics/North-Korea-sanctions-rattle-Russian-Chinese-businesses2. “US Threats Put Brakes on Russia Coal Exports via North Korea, Ambassador Says.” Hellenic Shipping News. September 2, 2018. https://www.hellenicshippingnews.com/us-threats-put-the-brakes-on-russian-coal-exports-via-north-korea-ambassador-says/. 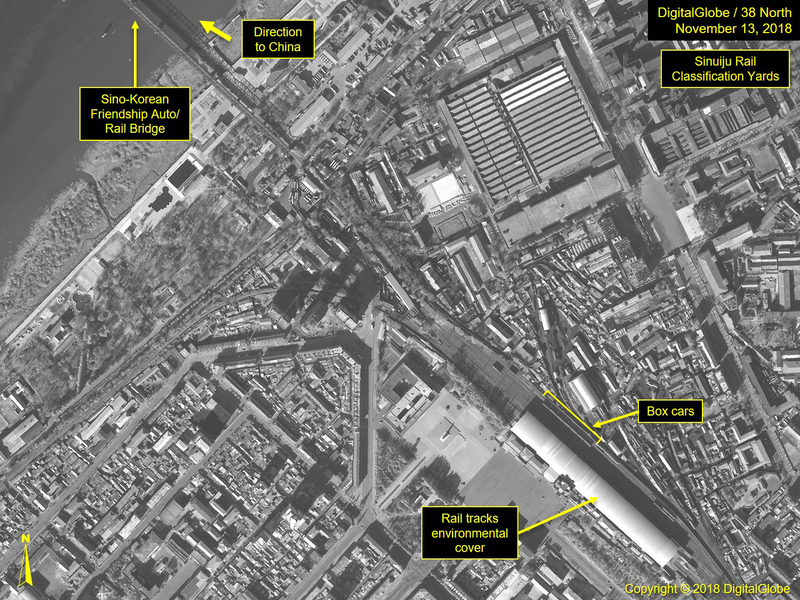 The Stimson Center and the National Geospatial-Intelligence Agency partnership uses unclassified imagery and data to produce new, timely, and accurate reporting on the North Korean economy. To read more, visit NGA’s Tearline article or download the Tearline app from the Apple Store or Google Play. This content also syndicates to the Office of the Director of National Intelligence’s website intelligence.gov, which is a transparency effort to better explain certain strategic and humanitarian IC missions to the public.